New siding on your home can do a lot to boost its curb appeal, as well as help insulate it better for higher energy efficiency. 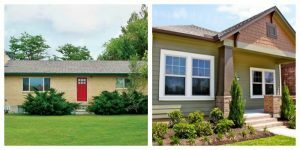 But there’s something else you can add to the equation to really step up your game when it comes to your home’s exterior aesthetics; the right trim. Blue Springs Siding & Windows explains why installing James Hardie Trim on the exterior of your home can add style and value to your home at the same time. Adding James Hardie Trim to tie the whole look together can create a large impact. The right siding added to your home can take a ho-hum looking house to a home with a uniquely styled look. Look at the difference siding makes in these pictures below of a house without matching trim, and one with James Hardie Trim. It’s astonishing the difference it makes. Another great thing about James Hardie Trim is that it comes in several different style and color options so that you get a perfect match with the style of your home. It’s always customizable, which means you get a beautifully unique look every time. No cookie-cutter, one style fits all here. Having a complete look not only boosts curb appeal instantly, but it also boosts your home’s resale value right off the batt. Curb appeal has a large influence on whether or not an interested buyer will give your home a second look. And with interest rates for mortgages likely headed back up in the next year, home values will likely take the opposite trend and slightly drop. Up your value now with this simple addition to your Kansas City area home. If you’re interested in installing James Hardie Trim to accent your James Hardie, or other siding, call your James Hardie Kansas City dealer, Blue Springs Siding & Windows, today at (816) 228-5225.